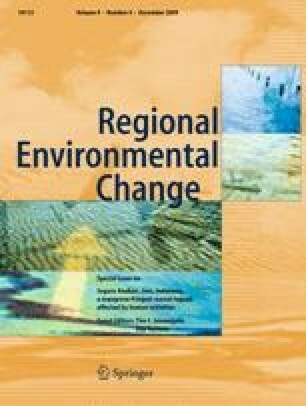 This study analyses how the conflict potential between different stakeholder groups is affecting the ecology and economy of the Segara Anakan region, a mangrove-fringed lagoon in central Java, Indonesia. The lagoon’s increasing sedimentation/silting up and the area’s expanding population has led to various interest groups conflicting with one another over how the resources of the lagoon and its surrounding area are to be utilized. Conflicts arise between occupational and ethnic groups in the lagoon’s bordering villages in the context of a transformation from fisheries to wetland agriculture. Land and mangrove use is therefore a cause for conflict between multiple groups, including Javanese fishermen, Sundanese farmers from Central and West Java and external shrimp farm owners. A result of the “Segara Anakan Development Project”—an 8-year undertaking that began in 1996—is that the lagoon was frequently dredged. Due to the dredging and resulting contamination of the land, a regional clash was triggered between Sundanese farmers and Javanese fishers. Our study reveals that the conflict potential between the various interest groups in the Segara Anakan Lagoon area could be reduced if the scarcity of natural resources were alleviated. Religious aspects also play a large role in marine resource utilization. Recognizing that the human utilization of natural resources is strongly symbolic and thereby culturally defined, we unravel the resource conflicts in our study area and offer some strategic approaches towards more sustainable outcomes. The authors thank: the SPICE project, Center for Tropical Marine Ecology (ZMT) Bremen; the University of Jenderal Soedirman, Purwokerto; and the Institute for Social Anthropology, Free University of Berlin for their support during this study. We especially acknowledge the lively discussion with Slamet Rosyadi, Edy Yuwono, Jajang Agus Sonjaya, Khairu Soebandi, Eberhard Krain, Tim Jennerjahn, Erwin Riyanto Ardli and Ute Luig. Thanks to those who have shown incredible support from the beginning, not only during the field research, but also during the development of this scientific paper.